Some of the best kept secrets to healthy aging -- such as promoting cardio health, brain health, restful sleep, bone and muscle health and even mood -- involve one mineral that millions of us fail to get enough of in our diet. An inadequate intake of Magnesium, not to mention low levels of Vitamin D and zinc can undermine many facets of our health. For this reason, "putting back what may be missing" is a smart strategy. However, not all Magnesium is created equal. 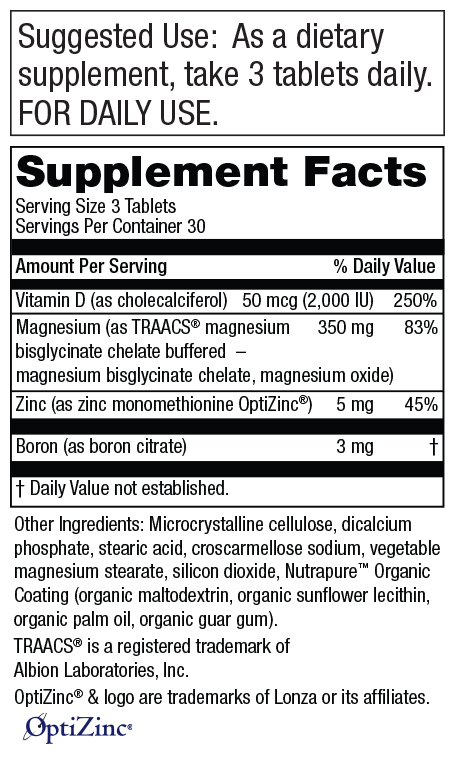 Most cheaper forms of Magnesium, like mag sulfate and mag carbonate are poorly absorbed, low potency, bulky options. Choking down several big tablets can make taking Magnesium a chore. At Purity Products we like to make supplements better through innovation and science. That’s our passion. In this spirit, Purity Products created MagVantage®, the high efficiency, high concentrate Mag solution, power-packed with 350 mg of Magnesium Bisglycinate Chelate Buffered. Manufactured by Albion Laboratories, one of the world's leaders in mineral chelates, our Magnesium Bisglycinate Chelate Buffered bonds the Magnesium to glycine a nutritional amino acid. Magnesium functions like a "cellular governor" in the body serving as a catalyst for over 300 metabolic enzymes that regulate a wide array of cellular functions from healthy mood to muscle function to cardio health. 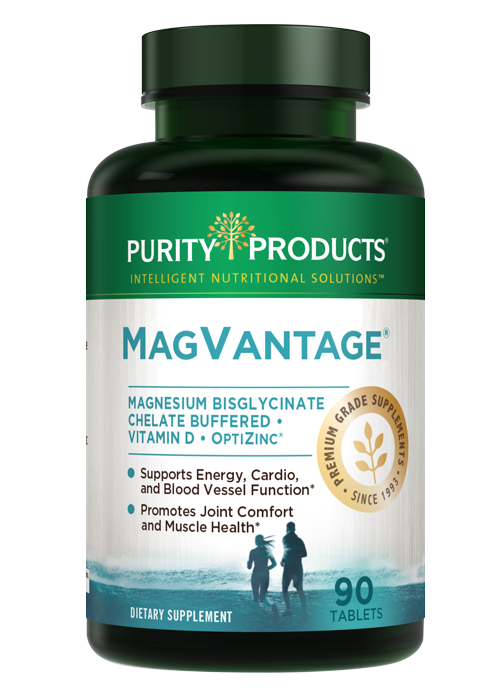 * MagVantage® boasts a full 18% bioavailability or efficiency vs just 4% for the lower quality Magnesium’s on the market, so in just 2 easy to take tablets, we deliver as much as you might find in 4 bulky Magnesium tablets. Enjoy more power with fewer pills. A report published in the Journal of Nutrition sounds the alarm: "Despite the role of magnesium in maintaining health, much of the U.S. population has historically not consumed adequate amounts of magnesium... Substantial numbers of U.S. adults fail to consume adequate magnesium in their diets." (Reference: Ford ES, Mokdad AH. Dietary magnesium intake in a national sample of U.S. adults. J. Nutr 2003; 133(9): 2879-82.) It's not hard to understand why-unless you eat plenty of magnesium-rich foods such as nuts, green leafy vegetables and whole grains, for example, you can easily run short. Fortunately, magnesium supplementation is a safe and reliable way to make sure your body has the magnesium it needs on a daily basis. Zinc is one of the most versatile essential minerals, support the health of a multiple of structures and functions, including function, reproductive health and healthy skin. * MagVantage® features OptiZinc®, a patented zinc supplement in the form of zinc monomethionine for superior absorption. Review: Effective and reasonably priced. I recommend this product to anyone who is serious about optimum well being. Thank you Purity for your honesty and genuine care for good health. Review: This product seemed to be very good, and I have noticed a difference. Glad I have it part of my supplement mix. Review: No dramatic difference but it does help. Review: Have renewed energy to sustain my life style. Im 63 now and work an average of 50 hours a week.After taking MagVantage for a month changes are noticed.Thank you Purity for your cooperation. Review: After using MagVantage, vitamin D and at least 6 pints of water regularly with my other vitamins for several months, Ive found myself improving on restful nights as well as recollecting my dreams in color. Something is making a difference!